Do you miss the Swallow-tailed Kites as much as we do? 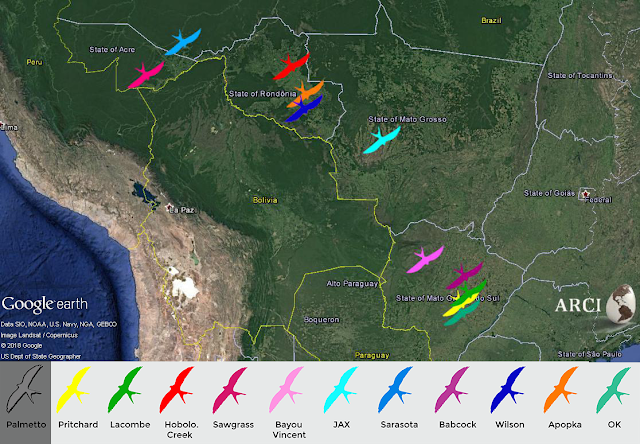 As of today, 5 November, our 11 tagged kites are spending the winter in Brazil. Pritchard, OK, Lacombe, Babcock, and Bayou Vincent are the farthest south in the state of Mato Grosso do Sul. JAX is currently the only tagged kite in the west-central state of Mato Grosso. To the northwest of JAX, in the state of Rondonia, are Wilson, Apopka, and Hobolochitto Creek. Sawgrass and Sarasota are in the western states of Acre and Amazonas, respectively. Palmetto’s transmitter lasted over 7 years – the longest in ARCI history. It finally stopped transmitting as she was crossing the Andes Mountains in Colombia. Her many successful past migrations lead us to believe she is still gracing the skies. While most of our 12 GPS-tracked Swallow-tailed Kites have made it safely to Central and South America by now, two of our feathered friends are still working their way southward through their U.S. breeding range. Here is where our 12 tracked birds are today (see previous post for a recap on where the kites were tagged). Both Wilson and Pritchard had been lingering near their nests in southeastern South Carolina, foraging mainly on the Savannah National Wildlife Refuge. On 23 August, Pritchard started south and quickly reach South Florida; although, this bird may already be over the Gulf as you read this note. Wilson left South Carolina just a few days ago, on 27 August. Hobolochitto Creek has flown through Texas to Mexico and just passed through the famous Veracruz “River of Raptors” migration corridor. Palmetto is nearing the Nicaraguan border. JAX is following the Caribbean coast of Costa Rica southward. Okaloacoochee’s (OK) last fix was in Panama, but OK is most likely deep into the Amazon and beyond sufficient cell coverage to upload the most recent location data. We are anxiously awaiting this kite’s next data upload. Sarasota, Sawgrass, and Apopka are also in Panama. We expect to lose their signals for a while as they cross through very remote areas of the Andes Mountains and Amazon Basin. We see that Babcock has made it safely through the Andes in southwestern Colombia. She must have taken a route close to cell towers. Bayou Vincent and Lacombe (both with satellite transmitters, which don’t need a cellular network to communicate) took very different routes across the Gulf of Mexico but have been 15 to 50 miles apart since passing through Nicaragua. They now are near the border of Colombia and Peru. Check back with us over the next few weeks as we continue to update you on the migration of Swallow-tailed Kites to their South American wintering destinations. In the southeastern United States, Swallow-tailed Kites are starting a 5,000-mile migration to South America for the winter. It will be the first time for the young-of-the-year, but their parents may have made this trip many times before. ARCI is tracking twelve Swallow-tailed Kites with satellite and GSM (cell phone) telemetry as they begin this journey. 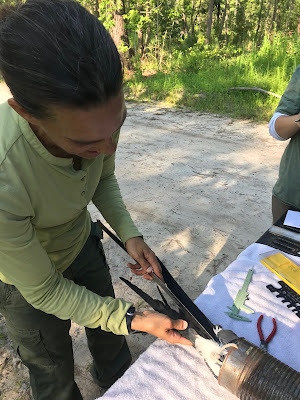 Five newly tagged kites – two in Florida, one in South Carolina, and two in Louisiana tagged by our project partner Dr. Jennifer Coulson – received their transmitters this past summer. This southbound half of their 10,000-mile migration cycle contributes fascinating behavioral, geographic, and habitat data to ARCI’s long-term tracking study of Swallow-tailed Kites. Palmetto, tagged in South Carolina in 2011, is beginning her eighth trip as a tagged kite! 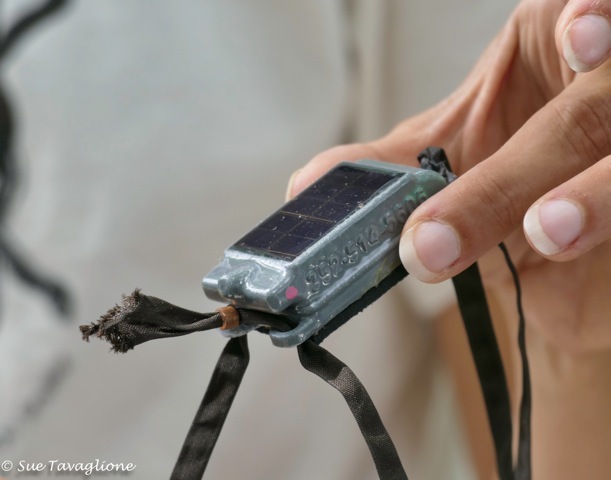 Who knows how many migrations these birds endured before they carried these sophisticated, solar-powered transmitters? A solar panel powers the battery in both the GSM (pictured) and satellite transmitters. The ultimate goal is to reach Brazil. To get there, most of the tracked kites leave from the southern tip of Florida for the eastern shore of Mexico’s Yucatan Peninsula, passing over or near the western portion of Cuba. The Swallow-tailed Kites from Louisiana usually follow the Gulf coast of Texas into Mexico. Although we might think the over-water route would be far more dangerous, 22 years of remote tracking shows that both pathways are relatively safe. However, weather and other unknown factors cause a few Swallow-tailed Kites to take different and sometimes riskier routes. The birds usually linger for a short time in the bountiful tropical forests of Mexico, Guatemala, or Belize before continuing southward. Unlike other raptors, such as Red-shouldered Hawks and Bald Eagles, Swallow-tailed Kites catch and eat their prey without missing a wingbeat. They pluck dragonflies and beetles out of the air and swipe anoles and frogs from the treetops, devouring everything without needing to land. The whole southbound trip may take a Swallow-tailed Kite anywhere from 8 weeks to 3 months. For the most part, they don’t rush. Instead they move at a slow but persistent pace, feeding as hunger and food availability dictate until reaching their wintering destinations. Unlike their northbound migration, when mates and a short nesting season await them, their southbound journey seems unhurried. Okaloacoochee (OK): Tagged in Collier County, Florida, in June 2018. OK was the first tagged kite to start migrating south, crossing over the Florida Keys on 7 July. It safely reached the Yucatan Peninsula after crossing over the western tip of Cuba and is currently in Panama. 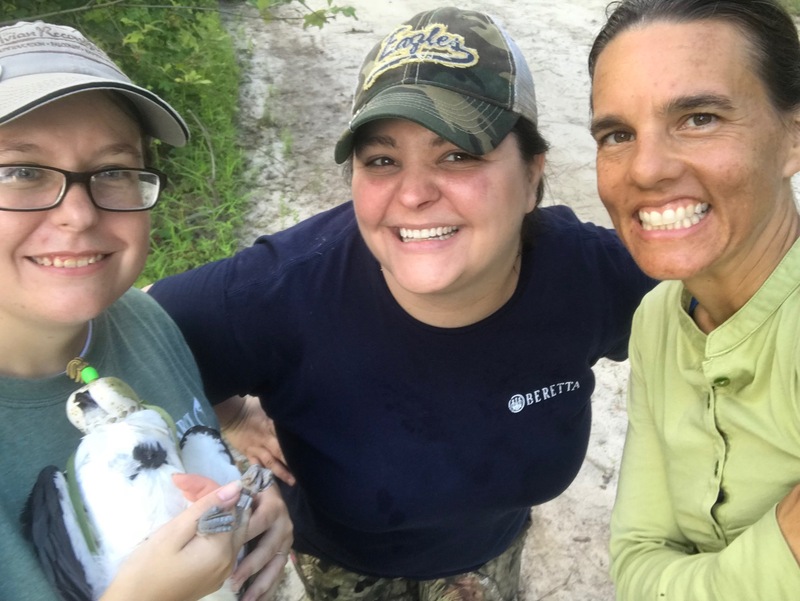 Bayou Vincent: Tagged in 2018 in Louisiana by our project partner Dr. Jennifer Coulson, President and Conservation Chair of Orleans Audubon Society. 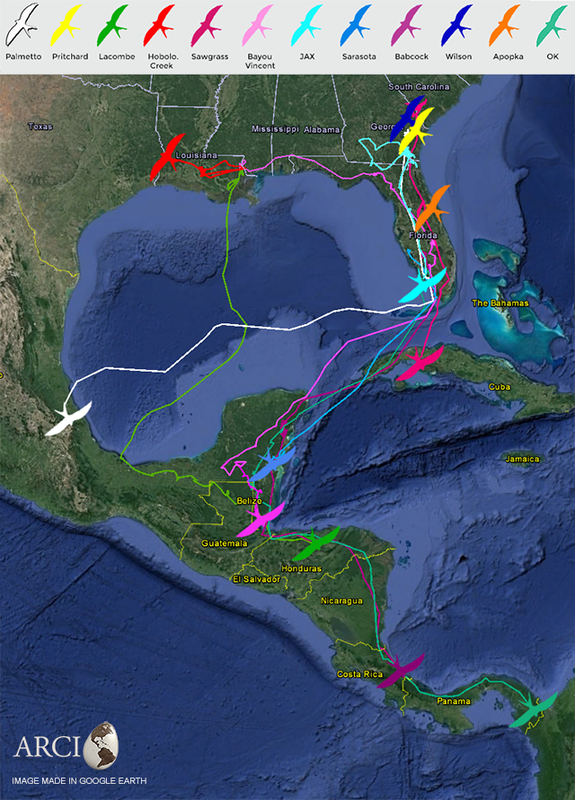 Bayou Vincent was second to show migratory movements, but unexpectedly flew east through Florida, skirted Cuba, and reached the Yucatan Peninsula on 28 July. Bayou Vincent is now in Belize. Lacombe: Tagged in July 2015 by our project partner Dr. Jennifer Coulson. On 25 July, Lacombe left Louisiana just west of the Mississippi Delta and flew due south for three straight days across the Gulf of Mexico. He spent a few days in Guatemala and is now halfway through Honduras. Babcock: Tagged in June 2017 at Babcock Ranch Wildlife Management Area in Glades County, Florida. She chose a more traditional route and left peninsular Florida on 28 July, crossed Cuba and reached the Yucatan Peninsula in Mexico on 30 July. Babcock lingered there briefly and is now in Costa Rica. Palmetto: Tagged in June 2011 at Palmetto Bluff, South Carolina. We have followed her longer than any other Swallow-tailed Kite. Palmetto moved to Georgia in July and on 4 August, decided it was time to fly south. She traveled down peninsular Florida almost to the Florida Keys, but instead of continuing towards Cuba, Palmetto was likely blown westward until she landed east of Mexico City on 10 August. Sarasota: Tagged in June 2017 at T. Mabry Carlton Preserve in Sarasota County, Florida. Sarasota left North Port, Florida, on 3 August and headed towards Cuba. He passed over the western coast of Cuba and is currently in Quintana Roo, Mexico. Sawgrass: Tagged in June 2016 at Sawgrass Lake Park in St. Petersburg, Florida. She moved from her nesting area in St. Petersburg to South Carolina in July where she remained until 6 August. Over the last week she has traveled through Florida and is currently east of Havana, Cuba. Wilson: Tagged in June 2017 at Palmetto Bluff, South Carolina. He is currently still in that area. JAX: Tagged in July 2018 in Jacksonville, Florida. JAX spent some time near Waycross, Georgia, in July but left the area on 7 August. As of 13 August, JAX is near Marco Island, Florida. Apopka: In June 2017, Apopka was rehabilitated at the Avian Reconditioning Center (ARC) in Apopka, Florida, after a car collision and received a transmitter before he was released. Apopka is still in Central Florida. Hobolochitto Creek: Tagged in 2018 in Louisiana by our project partner Dr. Jennifer Coulson. Hobolochitto has recently moved west from near Picayune, Louisiana, to the Louisiana-Texas border near DeRidder, Louisiana. Pritchard: Tagged in July 2018. Pritchard likely nested very close to Palmetto and Wilson in Palmetto Bluff, South Carolina, and is currently still in the area. MIA: No longer transmitting. MIA’s satellite transmitter quit as he was making his way north through Central America last spring. Birders in South Florida observed MIA nesting, business as usual, and this past June, ARCI’s Gina Kent recaptured MIA and removed the non-working transmitter. Refuge: Unknown fate. Last heard from in January 2018. Panther: Unknown fate. Last heard from in February 2018. Bogue Falaya: No longer transmitting. Bogue Falaya was tagged in May 2017 by Dr. Jennifer Coulson, who observed him since the transmitter quit and confirmed is alive and well. We could not be more grateful to the Jacksonville Zoo for supporting our Swallow-tailed Kite research! They funded both the tagging and tracking of a new adult Swallow-tailed Kite AND our Swallow-tailed Kite population monitoring flights coming up this July. JAX, who now carries a GSM/GPS transmitter. ARCI had not tagged a Swallow-tailed Kite in the Jacksonville area since 2012 (the last kite was Pace, tracked from 2012-2016), so we were unaware of any current nesting areas where kites could be found reliably. That was not a problem for the staff at Jacksonville Zoo, who led us to a perfect Swallow-tailed Kite nest site in northern Duval County, Florida. 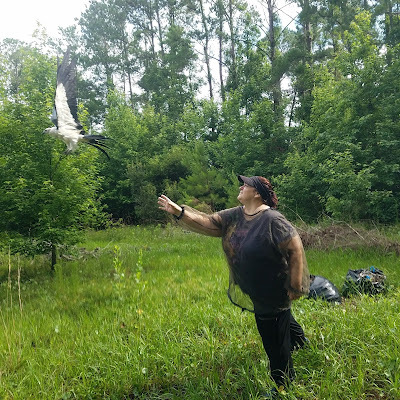 With hard work and a bit of luck, ARCI’s Ken Meyer and Gina Kent, accompanied by Jacksonville Zoo’s Donna Bear, successfully outfitted a healthy Swallow-tailed Kite, nicknamed JAX, with a GSM/GPS transmitter. JAX, short for Jacksonville, is the sole representative for North Florida in our tracking program, and we hope to follow its success for years to come. JAX remains in Duval County, Florida for now. is placed on the kite's head to keep the bird calm during the tagging process. It is a wonderful feeling to watch a Swallow-tailed Kite fly strongly away after it was successfully fitted with a transmitter. One mid-afternoon in early June, after the dark thunderclouds that frequent Florida’s summer skies had rolled through and the drizzle of rain had given us a reprieve, ARCI, staff from the Florida Panther National Wildlife Refuge (FPNWR), and members of the Caloosa Bird Club all experienced that feeling. FPNWR biologist Mark Danaher released the graceful, black-and-white raptor (see above video) and we cheered as we watched it turn into a silhouette in the cloudy sky. quickly removing the bird from the mist net. That silhouette is now known as Okaloacoochee (OK for short). Tagged in Collier County, Florida, south of Okaloacoochee Slough, OK now wears a GPS/GSM tracking unit that will show us its daily movements and migration patterns. 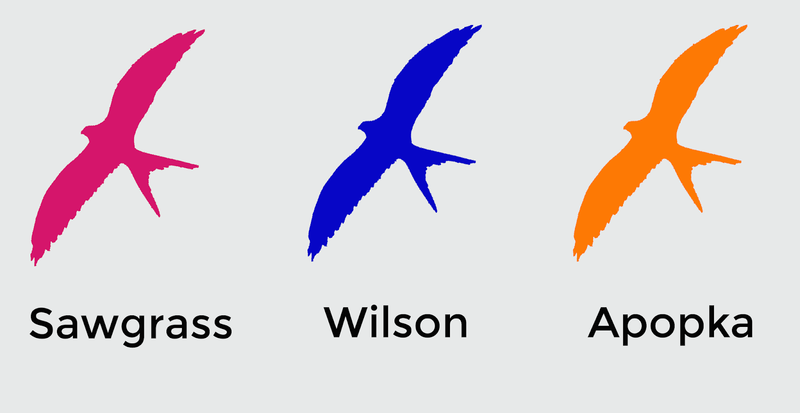 We do not yet know if the kite is male or female. With the GPS data we have already received, Mark was able to locate its nest, and to date, Okaloachoochee is in that same nesting area. of Caloosa Bird Club look on as ARCI fits OK with a transmitter. Right: Okaloacoochee's new GPS/GSM transmitter by Ecotone Telemetry. We would like to thank the Friends of the Florida Panther National Wildlife Refuge and the Caloosa Bird Club for their generous support enabling the tagging and tracking of Okaloacoochee. Two blogs ago, Sawgrass, Apopka, and Wilson were poised at the northeastern tip of the Yucatan Peninsula to cross the Gulf of Mexico. Wilson was first, leaving on 23 March and arriving in Panama City, Florida, on 25 March. He wasted no time gliding back to Palmetto Bluff, South Carolina, and was back near his previous nesting grounds by 29 March. Sawgrass followed next, departing the Yucatan on 25 March to regain solid ground east of New Orleans, Louisiana, on 27 March. She flew an almost identical route on her northbound migration in 2017. With a few short stops to snack along the way, Sawgrass traveled east along the coast, hopped across the Big Bend area of Florida, and reached St. Petersburg, Florida, on 7 April. As of late, her data show frequent movements between the Tampa and St. Petersburg areas. Sawgrass is not yet staying in one place long enough to suggest nesting, but she may choose to do so later in the season. Apopka crossed last, leaving the Yucatan Peninsula on 30 March and ending up south of Lafayette, Louisiana, on 1 April. He wiggled his way back east, reaching the vicinity of Apopka, Florida, on 9 April. He is staying local, and is currently in the Altamonte Springs area. Babcock is back on territory at the Babcock Ranch in Charlotte County, Florida. Not far to the northwest is Sarasota, a homebody on Myakka River State Park in Sarasota County, Florida. Both birds are sticking to small, localized areas, suggesting possible nesting behavior. Palmetto has returned to Palmetto Bluff, South Carolina, for the seventh time since her tagging. She arrived home on 14 April, 15 days before Wilson, and her data are clearly suggesting nesting behavior. Even though she and Wilson are using overlapping areas, they don’t seem to be cozying up to each other at the same nest site. Lacombe is residing in Louisiana between the cities of Slidell and Lacombe. This is his third year nesting in this area. He’s not far from Bogue Falaya, whose transmitter stopped on 16 March, shortly after he reached Louisiana after crossing the Gulf of Mexico. A few weeks went by without data. We feared the worst, as winds had delayed Bogue Falaya over the Gulf for longer than we would like. But then Dr. Jennifer Coulson, President and Conservation Chair of the Orleans Audubon Society and the woman who fitted Bogue Falaya with his transmitter, wrote to us saying she has seen him at his former nesting grounds near Pearl River, Louisiana, safe and sound. If you were to look at MIA’s data, it would show him in Honduras. His transmitter has failed after 6 long years of detailed, captivating data. With a guaranteed lifespan of three years, we were impressed his transmitter endured for twice that time, and knew the units could expire at any time. Thankfully, we know from our dedicated and wonderful volunteers that he is nesting again in Miami, Florida! He was spotted copulating and, more recently, tending to his mate while she incubates the nest. The whereabouts of Panther and Refuge are unknown. We last heard from them in early February and late January, respectively, when they were still in Brazil and just starting to move northward. Last year, we experienced long data lags for Panther, so we are hoping both birds are doing fine. Our colleagues at the Florida Panther National Wildlife Refuge are keeping close watch for kites carrying transmitters. We also have to remember that the GSM (cell phone) devices they are carrying have an expected life of just under 2 years. This could explain the lack of data for Panther, tagged in 2016, but not Refuge’s silence. 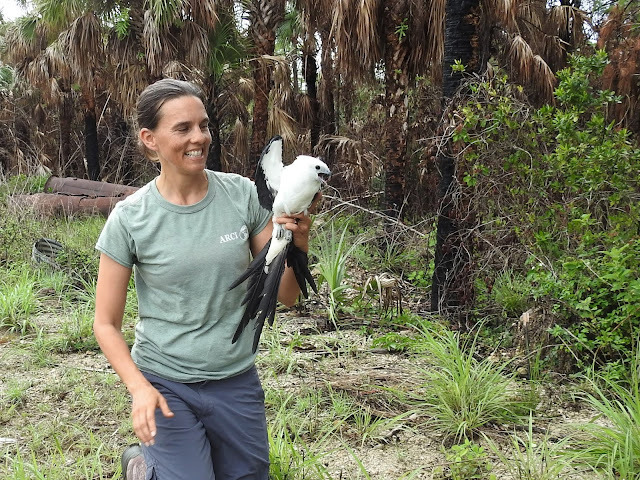 As for most adults in the U.S Swallow-tailed Kite population, these tracked birds probably are now doing their best to contribute to the next generation of Swallow-tailed Kites. It’s hard work building a nest, laying eggs, protecting against predators, and raising young. If you detect Swallow-tailed Kite nesting activity please report it to our sightings page. 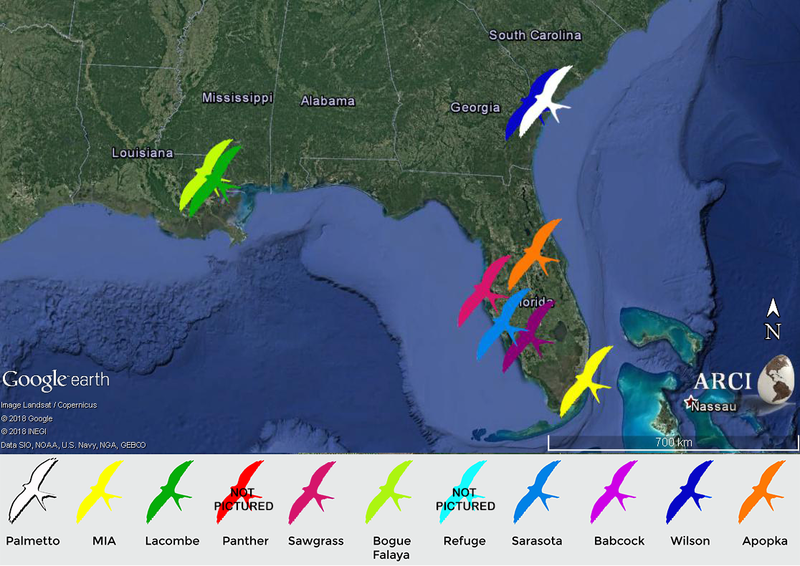 We hope you’ve enjoyed this Swallow-tailed Kite Northbound Migration blog series and look forward to sharing news on the kites’ southbound movements in the fall.